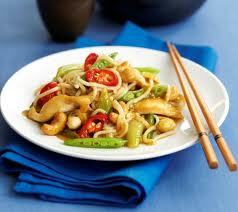 Here is a healthier version of everybody's favorite Chinese dish - Chicken and Cashew Nuts from http://shahiya.com/. 1. Combine the ingredients of the sauce together in a bowl and mix well until corn flour is completely dissolved. 2. In a non-stick pan, heat the vegetable oil and sauté the cashews in it until light brown. Remove and set aside in a bowl. 3. In the same pan, stir-fry the onions over a high flame until tender and golden. Remove with a slotted spoon and place in the bowl containing cashews. 4. Stir fry the chicken in the same pan for a few minutes until they change color, and then add the broccoli, carrots, red pepper, and bamboo shoots and cook until vegetables are soft but still crisp and hard just like you have them in a Chinese restaurant. 5. Pour the sauce over the chicken and vegetables and stir for a few minutes until it thickens. Then add in the onions and cashews and stir for a minute before turning off the heat.